Preface: This is a theme I'm very excited about, and one I've been wanting to do for a long time. In spite of the title, however, there aren't actually going to be any Joe Bonamassa songs. This theme is about the British blues songs that Joe has covered over the past decade. I've stated on many occasions how great a cover artist Joe is - both in his taste in selecting songs to cover, and in his ability to perform them well - and now you'll be able to discover first hand some of the original source material he has worked from. Joe has recorded a lot of truly great covers, so this isn't going to even necessarily be the songs that inspired his greatest covers, but a thematic selection focusing on one of my favorite sub-genres of blues rock - the British blues boom of the 1960s (with a tiny bit of leeway). Let's get started. Comments: Unique to the live version of the A New Day Yesterday album (Joe Bonamassa's first live album, and the first album of his that I heard) is a guitar instrumental mash-up consisting of two great tracks by two of the greatest rock guitarists of all time. The first is Steppin' Out, recorded by Eric Clapton with John Mayall's Bluesbreakers for the album many consider to be the quintessential representative of the 1960s British blues scene (informally referred to as the Beano album, thanks to the comic Eric is holding in the photo on the cover); and the second is a quirky meandering piece titled Rice Pudding (as far as I know, the abrupt ending is intentional), from Jeff Beck's second solo album, Beck-Ola. In Joe's composite jam, he manages to flawlessly weld the two central riffs from these songs together. Comments: This Jethro Tull track from 1969 (granted, they may not have been a straight blues rock band, but they were bluesy to start) lent the title to Joe Bonamassa's solo debut album, which is the first of a few of his albums named for a prominent cover song. With all due respect to Jethro Tull, Joe's version of this song is incendiary, and the version from the live album was the track that single-handedly introduced me to and got me hooked on Joe Bonamassa, for good reason. Honorable mention goes to Irish blues rocker Rory Gallagher's Cradle Rock, which also appears on Joe's debut album (as well as the live version of the album). Comments: Jeff Beck returns, with the track that titled Joe Bonamassa's third studio album, a riveting blues penned by Beck and bandmate Rod Stewart, appearing on Jeff's own solo debut album, Truth. Bonamassa again shows his ability to smooth out the original Jeff Beck Group's rough-edged recordings, creating a very compelling track that, in addition to showcasing his celebrated guitar talent, features an impressive vocal performance which demonstrates his continuing improvement as a singer in addition to guitar god. Joe's eighth studio album, Black Rock, features another winning Jeff Beck cover in the form of Spanish Boots (found on Beck's second album from 1969, Beck-Ola). Comments: Eric Clapton returns this time, and with the song that titled Joe's fourth studio album. This track is from the self-titled (and only) album released by the short-lived supergroup Blind Faith, which was Clapton's first diversion after the breakup of Cream. Even with all the hype, and having become familiar with half of the album before ever hearing it in full (thanks to the popularity of those songs), when I recently picked it up, I was pleasantly surprised by the overall quality of the album. For this song, which has a nice rock edge, and a good jam format, Joe scores another faithful and successful cover, a highlight of his earlier live shows. Comments: Joe's fifth studio album, You And Me, marks a turning point of sorts in his career. It marks the beginning of his partnership with producer Kevin Shirley, and thus a crystallization of his "studio sound". One of my favorite tracks on the album is the blues So Many Roads, which was recorded by John Mayall's Bluesbreakers in the 1960s - but this time with Peter Green as the guitarist instead of Eric Clapton. It's a powerful song, and even with Peter Green being one of my top favorite musical artists of all time (granted, even as lead guitarist, he was still mostly backing for John Mayall in that band, and hadn't yet hit his stride), Joe's version of the song rises above this previous version. But don't stop there, legendary bluesman Otis Rush does a pretty mean version himself. Two other tracks worth mentioning that were recorded by the Peter Green-era Bluesbreakers, and were covered by Bonamassa, are Your Funeral And My Trial, and Another Kind Of Love. 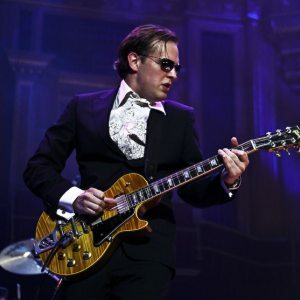 Comments: I had been waiting for Joe Bonamassa to do a Ten Years After cover, ever since catching a mention of them in the liner notes to one of his albums, and on his sixth studio album, Sloe Gin, he pulled through. Like Led Zeppelin, Ten Years After were a hard rock band (with a variety of accompanying flavors), and not strictly British blues, but, also like Zep, they were British, and they had a concentration in the blues. Joe's cover of the opening song to TYA's most popular album is adequate, but I regret to say that this is one of the times when the original is clearly superior. Sorry Joe - it's just that Alvin Lee has this totally unmatchable rock charisma, and this song benefits more from the rough edges than the smoother melodies which Bonamassa likes to emphasize. You can't win them all. I'm still very excited that Joe covered this song and I would be happy to hear him try his hand at another, as Ten Years After is one of my favorite blues rock bands, and they deserve the attention and recognition. Bonus Track: Although it's probably even less British blues than anything else on this list (although still not completely off topic), I just have to mention Tim Curry (yes, that Tim Curry)'s Sloe Gin [Read My Lips, 1978], which titled Joe's sixth studio album. It's a powerfully depressing song, delivered passionately by Tim Curry, and covered impressively by Joe Bonamassa. Joe stays true to the soul of the song, while giving flesh to the bones of its structure, building up a truly captivating piece that stands out even in his impressive catalogue of great music.